A look at everyone's favorite TV boss. For some reason, I am still in a WatchMojo phase and have decided I need to do another top ten list article. "The Office" is one of my favorite shows thanks to my little for getting me to watch it sophomore year of college. 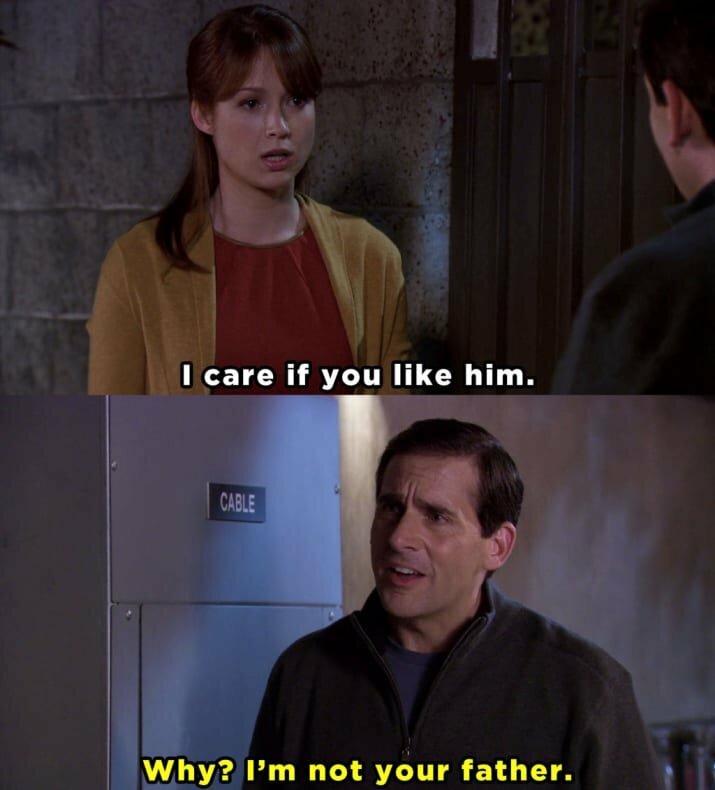 We all love Steve Carrell’s portrayal of Michael Scott and while at times he can be a little awkward and make us uncomfortable he is a very caring and compassionate man. In no particular order here are seven moments Michael showed us why he is the world’s best boss. The relationship between regional manager and assistant to the regional manager was always on display on this series. It would bounce around between work colleagues to best friends to even partner in crime. When Michael returns to surprise Dwight at his wedding after Jim tells him he can’t be the best man we are overcome with excitement and emotions as we see Michael and Dwight embrace. It is truly an emotional sequence and a display of the relationship between these two. Through the first few seasons, there are moments where Michael makes us a little uncomfortable but he makes one gesture toward Jim which is memorable. After hearing Pam and Roy set a date for their wedding Jim is heartbroken and ends up talking to Michael. During the conversation, Michael gives some advice to Jim which is different than what we would expect from Michael Scott. “Never Ever Ever Give Up.”. This quote goes a long way as it provides Jim with motivation to continue his love for Pam and eventually marrying her. Not wanting to lose his position Michael tries to sabotage the interview for Jim to become regional manager but eventually the two become co regional managers. While there are some issues with the two being co-managers there is an act of kindness when Michael brings Jim a “World’s Best Boss” mug just like the one Michael has. Seeing this moment between the two of them begins a new relationship with colleagues but also as friends. Dwight has always wanted to be Regional Manager but there is always something in his way. Before Michael leaves to move to Colorado to be with Holly and start his new life he writes a recommendation letter for Dwight for when he wants to become Regional Manager. 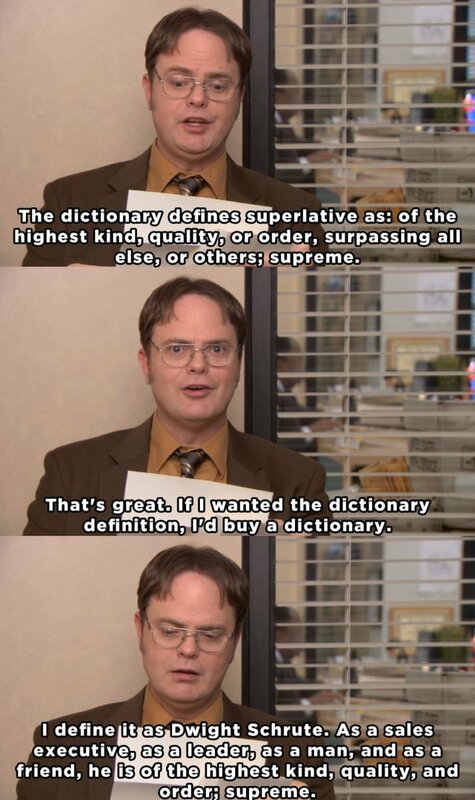 "The dictionary defines superlative as: of the highest kind, quality, or order, surpassing all else, or others. Supreme. That's great. If I wanted the dictionary definition, I'd buy a dictionary. I define it as Dwight Schrute. As a sales executive, as a leader, as a man, and as a friend, he is of the highest kind, quality, and order. Supreme." Seeing this act from Michael shows he looks at Dwight as a friend rather than just an assistant and it can’t help but a bring a tear to our eyes. When the Scranton Branch finds out they will be in a commercial for Dunder Mifflin everyone gets excited and Michael wants everyone to participate. Everyone is having a great time and when Michael pitches the idea to corporate they turn it down and say that they want Scranton to use the same format from previous commercials. While the commercial airs and everyone seems pleased Jim and Pam decide to show everyone the commercial Michael envisioned and is received positively by the workers. This cheers up Michael and he realizes that his workers do care about him even if they don’t always show it. 7. Realizing Erin sees him as a father figure. After hearing this Michael realizes that Erin actually views him as a father figure and he then acts like an angry father in a cute way towards her. I always loved Michael Scott because he had a passion and drive for all the workers at Dunder Mifflin and he was the family he always wanted. While there are times that Michael did go overboard he truly was a caring boss for everyone and he always found a way to let them know they matter and he thoroughly cares for them.